I try to eat a daily dose of almonds, oats, and prunes — good sources of protein, cholesterol-lowering fiber, and iron. 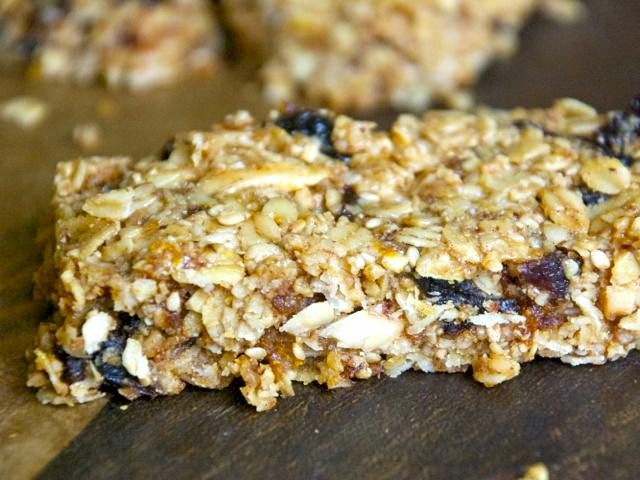 This nutritional trifecta makes for a nutty, chewy trail bar and snack. Preheat the oven to 350 degrees. Butter a 9-by-13-inch baking pan and line it with parchment paper, leaving some hanging over the edge; set it aside. On separate baking sheets, toast the oats and almonds, stirring occasionally, for 8 to 10 minutes, until they smell toasty. Toast the wheat germ and sesame seeds for 3 to 4 minutes. Set aside to cool. In a small pan, combine the oil, butter, maple syrup, brown sugar, and almond butter; bring to a simmer and cook, stirring often, until the mixture is melted and smooth. Remove from the heat and set aside. Pulse 1 cup of the toasted almonds in a food processor until finely ground but not pasty. Roughly chop the remaining half-cup of almonds. In a large bowl, combine the oats, ground and chopped almonds, toasted wheat germ, sesame seeds, cinnamon, salt, chopped prunes, and orange zest. Pour the almond-butter mixture over the dry ingredients and stir until combined. Stir in the beaten eggs and mix to combine. Press the batter into the prepared baking pan, packing it down with the palm of your hand. Bake 25 minutes, until golden brown. Cool 1 hour in the pan, then loosen the edges with a butter knife and pull out by the edges of the parchment paper. Place on a cutting board and cut into bars or squares.